I proposed an “IQ Test for Criminals and Liberals” back in 2012 which asked readers to imagine that they were thieves. a. break into the house because you once heard a politician or journalist assert that gun ownership doesn’t deter crime? b. decide after a bit of reflection about potential costs and benefits that it might be more prudent to find another house to rob? My goal was to help well-meaning leftists understand that criminals respond to incentives. And even the really stupid ones will seek to maximize how much they can steal while minimizing the risk of bad outcomes. And if you’re a criminal, one potential bad outcome is getting shot by an armed homeowner. The same cost-benefit analysis applies to mass shooters. Regardless of whether these shooters are motivated by feelings of inadequacy or Islamofascist ideology, their goal is to kill as many people as possible before being stopped. And when these nutjobs start shooting in places where there’s very little likelihood that they’ll encounter immediate armed resistance, that means a higher body count. Which is what happened at Fort Hood. And in Santa Barbara. And in Newtown, Connecticut. And at the Aurora movie theater. And at Virginia Tech. Needless to say, this sign didn’t stop the attack. It may have even encouraged the attack. In any event, the rule did affect one group of people, as Sean Davis explained for The Federalist. 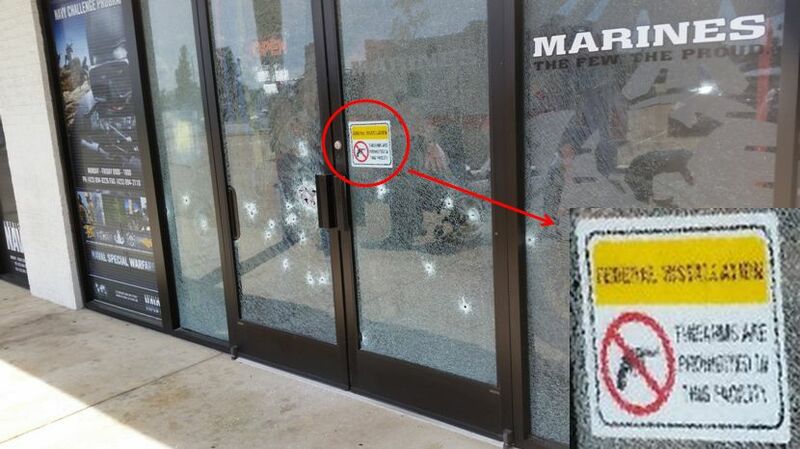 The gun-free zone sign didn’t prevent the shooter from firing a gun at completely innocent individuals within the zone. It did, however, prevent them from defending themselves. And here’s the really depressing part of this tragedy. The military personnel targeted by the terrorist weren’t unarmed because Chattanooga had bad policy. They were unarmed because of federal government policy. Writing for Fox News, John Lott explains this bizarre policy. Army regulations are very clear stating that personnel cannot have firearms during their official duties. Last year the Obama administration instituted interim rules that clearly prohibit privately owned weapons from all federally leased office and land, including recruiters’ offices. …With the exceptions of military police, military personnel are banned from having weapons on base, in federally leased buildings, or while they are carrying out official duties. For would-be terrorists among us there is an abundance of possible targets. …Allowing military personnel to at least defend themselves reduces the number of easy targets that terrorists/killers can attack. Amen. Let members of the military have the ability to defend themselves. And expand concealed-carry laws so that citizens also have greater ability to thwart crime and mass shootings. P.S. I shared above a great cartoon from Chuck Asay. You can click here to see another. And these two posters make the same point quite effectively. P.P.S. While folks on the left are one of the targets of my IQ test, not all liberals are misguided on the gun issue. As you can read here and here, there are a couple of them who put reason ahead of ideology. P.P.P.S. It’s also encouraging to note that some lawmakers realize it’s a good idea to have more protection for schoolchildren. Gun-free zones are the safest places in the world according to liberals. There is no such thing as a “well meaning leftist.” They are all about subjecting everyone to a dictatorship and installing themselves as the dictators. Gun Free Zones = Freedom Free Zones.